Ancient Romans celebrated Saturnalia rather than Christmas, and 21st century Roma Novans are no different. Here we join the Roma Novan Mitela family on a snowy day as they are preparing their Saturnalia feast. Welcome to the party! “Thirty-six hours later, we were snowed in. The newsies were having a field day with their graphs and charts. The ploughs and tractors were out soon enough despite it being an official holiday and were attempting to keep the main city roads cleared. Although most of the public Saturnalia celebrations were cancelled, the priests would make the usual grand sacrifice and invoke Saturn’s blessings. I pitied them today; it was a Greek rite and they’d have to shiver in sleeveless fringed tunics, with heads bare instead of a warm woollen toga snuggly folded over the head. It was a sure bet they’d turn up the heating in the Temple of Saturn and have every open brazier burning hard. My husband, Conrad, and our youngest daughter, Tonia, sat in silence at breakfast. Our eldest, Allegra, had called first thing to say she would join us just after two when she finished her shift. She looked tired on the screen; hopefully she’d get some sleep before tomorrow. She’d been called in with the rest of the military to help ensure vital services were kept running. ‘Unfortunately,’ she said in the driest tone I’d ever heard her use, ‘some people seem to think the custodes concentrating on the bad weather crisis means they can help themselves to what’s in the shops. I’ve been freezing my, er, extremities off in the Macellum district all night. We came across some kids with a crowbar in front of a smashed window, pulling stuff out of an electrical goods shop. The alarm was going, but so were others. As soon as they saw us, though, they ran like the Furies were after them.’ She chuckled. The sight of half a dozen Praetorians marching towards you with intent and attitude would make anybody run. ‘But they’ve opened the basilica for the public banquet. 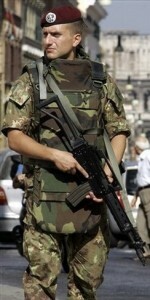 My oppo, Sergilia, has caught guard duty there,’ she added, making a face. The law court hall was huge and could accommodate up to a thousand. But good luck to those trying to keep order. After checking last details with the steward for the celebration meal later, I retreated to my office for an hour to check my messages and that nobody had found my stash of gifts for the 23rd. Sigillaria was important not just for the kids who loved new toys, but when adults gave each other something to compensate for the excesses that would surely happen today. Normally on Saturnalia morning, my cousin Helena and I would sip a glass of champagne and exchange jokes and snippets of gossip. She had more than a finger on the pulse of city life; its lifeblood ran through her. She’d also forewarn me about any particularly risqué activities the household were planning for today. Ceding my place at the head of the Mitela tribe for a day to the princeps Saturnalicius was all well and good, but even misrule and chaos had its limit as far as I was concerned. But for a few hours, the house would be overrun with noise, people, stupid but fun dares, overeating, games, theatricals and stand-up of dubious taste, arguments, falling in lust, laughter and progressive drunkenness. Helena would make sure the children were safe out of the way when the horseplay became a little too raunchy. By early afternoon the atrium blazed with light. Everywhere was covered in ferns, spruce and pine. In the centre was a large square table covered with linen, silverware, glasses, candles and the best china. I smelt roast pork, lemons and spices. In tune with the reversal of the day Junia, the steward, was enthroned in my usual place. Conrad handed me a glass of champagne. He was on waiter duty. His Saturnalia tunic was bright orange. He shrugged. Then grinned. Wearing over-colourful clothes was traditional, but a strain on the eyes. ‘It’s only for a day,’ he whispered. Our thirteen-year-old son had been staying in the country with Conrad’s cousin and was caught in the atrocious weather. We’d be lucky to see him before Sigillaria. 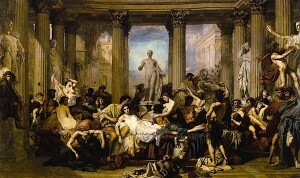 Gil loved the madness of Saturnalia. My geeky son would turn into a shiny-eyed imp of mischief, darting around, laughing and joking, pulling pranks I didn’t know he knew. Now he’d be holed up with Conrad’s serious cousin for days. I only hoped they had enough food and the electricity hadn’t been cut, like the phone. ‘Well, Tonia’s having fun.’ Conrad pointed to her skipping between people with trays of hors d’oeuvres, watched anxiously by the steward’s son, and me. I could see at least one of the trays coming to grief, contents slithering across the marble floor. I blinked at the hearty shout from the household and guests gathered around and raised my glass, then bowed towards the steward. She went to speak, but a blast of cold air and a loud thud interrupted her. All heads turned towards the atrium doors, now open. Allegra, in her military fatigues and winter parka, cheeks burning with the indoor heat, tore off her field cap and shouted, ‘Io Saturnalia’. Everybody shouted back, the noise filling the atrium. I hugged her to me, ignoring the cold and wet of her thick coat. ‘I’ve brought you something else, Mama,’ she whispered in my ear and nodded towards the double doors. On the threshold stood a lanky boy – pale, shivering and wide-eyed. He was enveloped in a survival blanket. But I didn’t hear the rest of what she said. I ran to the door and crushed him in my arms. Sorry, this has now ended, but you still enjoy PERFIDITAS, the second in the Roma Nova series, where betrayal infuses the air and our heroine is caught between the light and dark – by downloading from your favourite retailer. Loved your first book and would love to read this next one, I remember how believable your country of Roma Nova was and I still remember the storyline after a couple of year, that says a lot about a book. Thank you, Rosie! I shall treasure that comment about INCEPTIO. What an intriguing premise for a story! Really unusual Thanks Alison, I enjoyed meeting the Nova Romans. Thanks, Lauren. I’m a bit of a ‘Roman nut’! The idea has been floating around my head for years and in 2013 I did something about it. I know! But like most Roma Novans, he’s been bred tough, and he really did want to get home. WOW Alison! Thank you for this. I did enjoy reading that heart-warming little tale. Before you introduced us all to Saturnalia I knew nothing much about the feast. One thing which has fascinated me is how so many Christian traditions have originated from this feast. Raising my glass to you and yours. Hopping off to have a few more glasses with others you have included in the links….. Io Saturnalia x. This passage really captures the mix of feelings such parties evoke – all that enjoyment yet it can be a bit wearing! Really enjoyed reading it. Thanks, Lucienne. Yes, parties are a mixed blessing. Saturnalia was very important to Romans and, of course, is now to Roma Novans, but people in any era have the same human reactions. Wishing you a splendid Saturnalia, Alison! Enjoyed this brief visit with Conrad and Carina! Looking forward to Book 4 in the series. Glad you enjoyed it. You can read more excerpts by clicking the icons on the left top of this page, if you like. Love all your books – and so enjoying this blog hop! Thank you, Helen. This is the buzziest hop I’ve been part of! Congrats on your superb organisation of it all. Gil was *so* determined to get home for Saturnalia! That’s a cool new world! I liked this introduction to Saturnalia on Roma Nova! Thank you, Sara. Roma Nova keeps the original (and important!) Roman festivities and way of life going, even in the 21st century. I’m so glad everyone made it home! 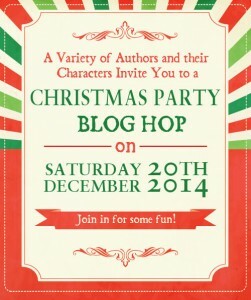 Saturnalia sounds excellent – I want to be at that party! You’d be a very welcome guest, Nicky! Hope you enjoy it, Richard! 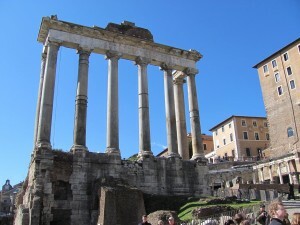 Roma Nova is actually more Rome oriented, Gladys, but thank you for commenting. This was powerful, Alison. The Roma Novas bring the past to the present. So cherishing family time is apparently just as important at Saturnalia as at Christmas – excellent connection! I never knew about the role swapping either. I used to work in a Church of England boarding school where the Headmistress and management team has to serve Xmas dinner to the housekeeping staff – bet they didn’t realise they were being Saturnalian! Haha! Although we don’t realise it, ancient Rome infuses our European societies is ways we don’t imagine or realise. As it’s often little things like the role swap. Now what else did the Romans do for us…? Intriguing mix of ancient Roman practices and modern times! Yes, quite interesting to write Saturnalia customs in the 21st century without pandering to the popular culture perceptions. But fun! well here we are at the end of 2014 and I’m enjoying browsing through our Blog Hop – what a celebration it has been! Thanks for joining in Alison & all your help with promoting the event. Happy New Year! Thank you for organising this celebration, Helen. A prosperous and healthy new year to you! And the winner of a signed copy of PERFIDITAS is….